On Wednesday, July 9, the feast day of the Tikhvin Icon of the Mother of God, His Grace, Eastern American Diocesan vicar Bishop Nicholas of Manhattan, celebrated the Divine Liturgy in Our Lady of Tikhvin Church in Howell, NJ, leading the parish’s patronal feast day. His Grace was co-served by parish rector Protopresbyter Valery Lukianov, Archpriest Alexander Belya (dean of New York City), Archpriest George Kallaur (rector of “Unexpected Joy” Church in Staten Island, NY), Archpriest Liubo Milosevich (rector of Holy Trinity Church in Vineland, NJ), Archpriest Mark Burachek (rector of Our Lady of Kazan Church in Newark, NJ), Archpriest Petro Kunitsky (cleric of Holy New Martyrs & Confessors of Russia Church in Brooklyn, NY), Archpriest Boris Slootsky (cleric of neighboring St. George’s Church in Howell), Priest Seraphim Chemodakov (parish cleric), Priest Serge Ledkovsky (deputy rector of neighboring St. Vladimir Memorial Church in Jackson), and Protodeacon Michael Soloviev (cleric of Nativity of the Mother of God Church in Albany, NY). 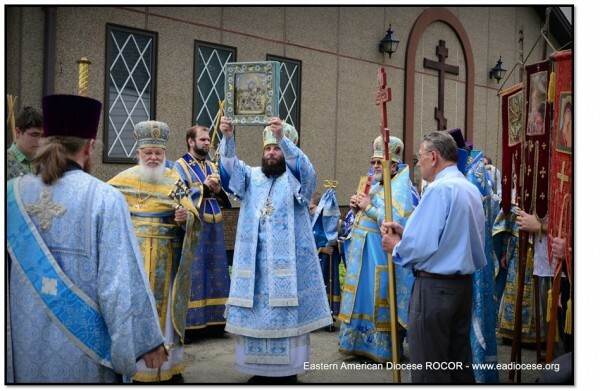 Our Lady of Tikhvin Church in Howell became the first church in the Eastern American Diocese in which the newly consecrated Bishop Nicholas celebrated the Hierarchal Divine Liturgy. Greeting His Grace, Fr. Valery wished him God’s aid in his service to the Holy Church, and that in his Archpastoral service he might never forget his glorious forebearers ‒ the hierarchs of the Russian Church Abroad. Many of the church’s parishioners, as well as faithful from Brooklyn and across New York City, came to mark the parish feast day of Our Lady of Tikhvin Church and to honor the wonderworking Tikhvin Icon of the Mother of God. This icon, preserved in Howell, is renowned as the “Royal Icon:” in 1972, it was donated to what was then St. Alexander Nevsky Church by Lakewood resident Olga V. Astori-Astafiev, whose mother received the icon as a gift from the Holy Empress Alexandra Feodorovna in 1913. Upon completion of the Liturgy, the clergy and parishioners performed a procession around the church. As Bishop Nicholas of Manhattan’s spiritual father, Fr. Valery reminded the faithful of how the future hierarch was raised in their midst, and of his humility and quiet character, which came to him naturally. Fr. Valery wished His Grace good health, that his heart might always be full of joyous spring, and that this joy might settle upon all those whom he might meet on his path. On behalf of St. Alexander Nevsky & Our Lady of Tikhvin parish, the rector presented Bishop Nicholas with a set of lesser Paschal vestments ‒ the omophorion, epitrachelion (stole), and cuffs. In a brief reply, Bishop Nicholas assured the clergy and parishioners that he will commemorate them in his prayers before God’s Altar. A bountiful festal luncheon was prepared in the parish hall, where His Grace continued to receive kind and heartfelt words of congratulation on the occasion of his consecration to the episcopate.